Orchardleigh wedding. Flowers by Pulteney Bridge Flowers. 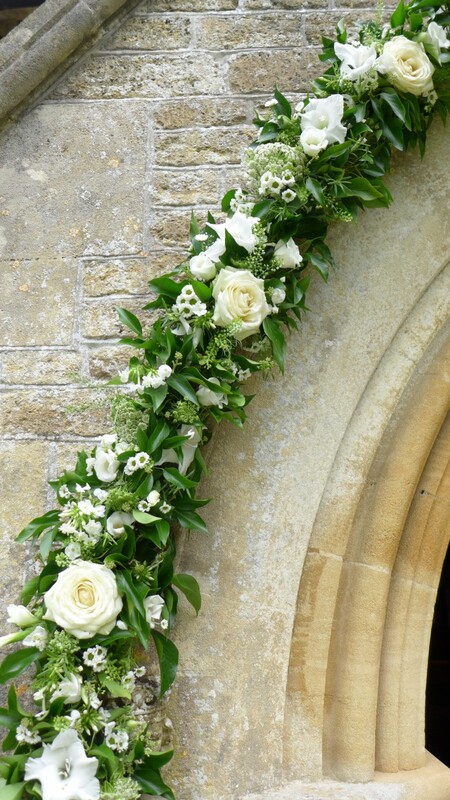 You are here: Home > Wedding flowers at Orchardleigh. Posted by Lorely on August 12, 2014. Orchardleigh is a beautiful Somerset estate 10 miles south of Bath, with an incredible stately home built in 1856 and the island church of St. Mary’s it really is a perfect place for fairytale weddings. 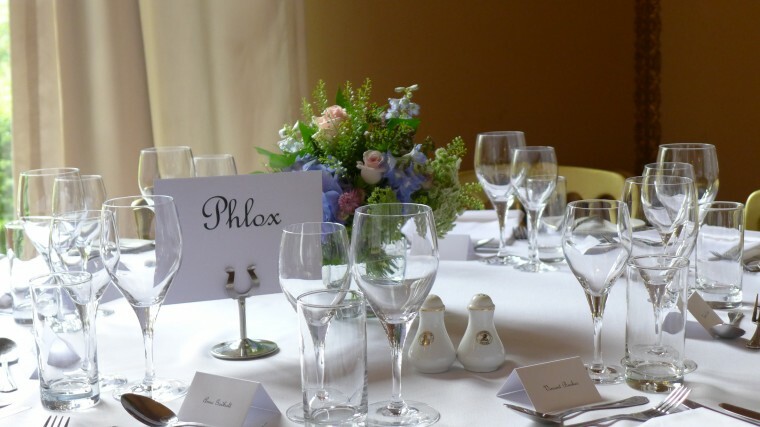 We always enjoy coming out from Bath to do the flowers for weddings at Orchardleigh, the elegant ballroom looks stunning with the tables laid and the big windows looking out onto the estate. However my favourite part is decorating the church, set on the edge of the lake surrounded by a moat it is so peaceful. There is no electricity so all the services are held by candle light and the organ has to be pumped by hand. 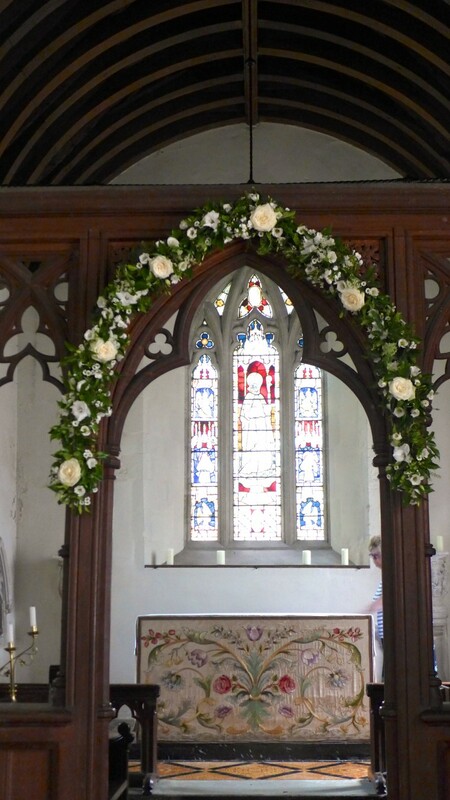 It only holds a congregation of 100 people so it is definitely intimate, if this church is to small there is also a beautiful church at Lullington. This weekend Laura and Gary were getting married at St Mary’s so we had the pleasure of decorating the arches, and filling little vases to sit in the window ledge. 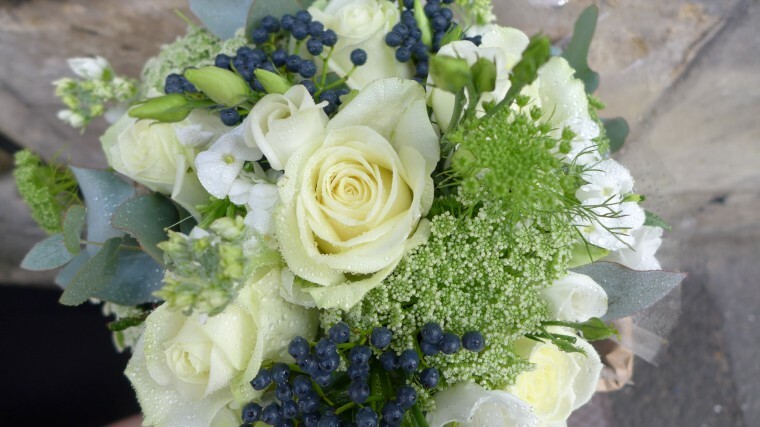 All the flowers were to have a natural country look, Laura had chosen whites and greens so we made bouquets of avalanche roses with dill, stocks, phlox eucalyptus and viburnum berry to give a hedgerow look! 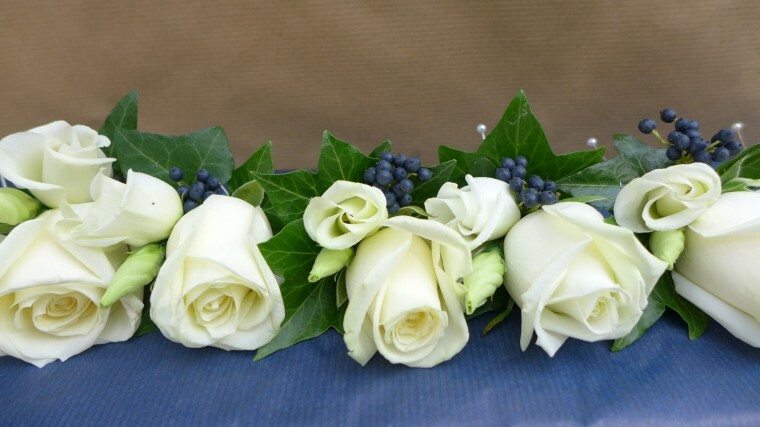 The flower girls had garlands of lisianthus and september flowers for their hair, And the men’s buttonholes were avalanche roses with lisianthus buds and viburnum berry. 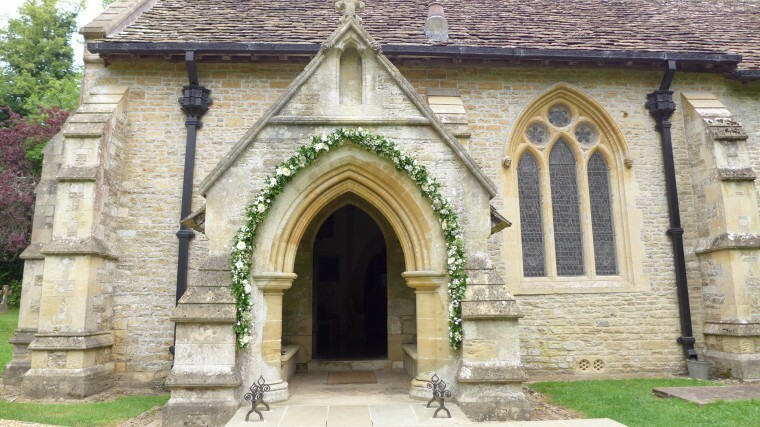 Nicola made garlands of roses, phlox, lisianthus, santini and green bells for the main entrance archway and for the beautiful wooden arch inside which always looks magical with the candles burning. 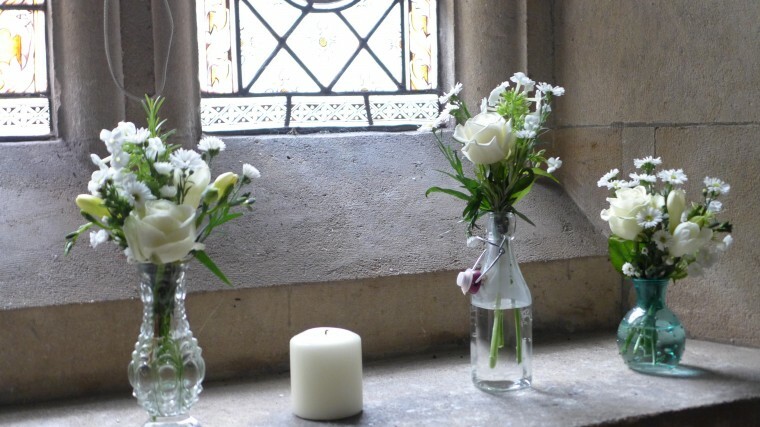 It also was a lovely idea to have a row of little mismatch bottles on the window sill which we filled with cottage garden flowers in whites and green. 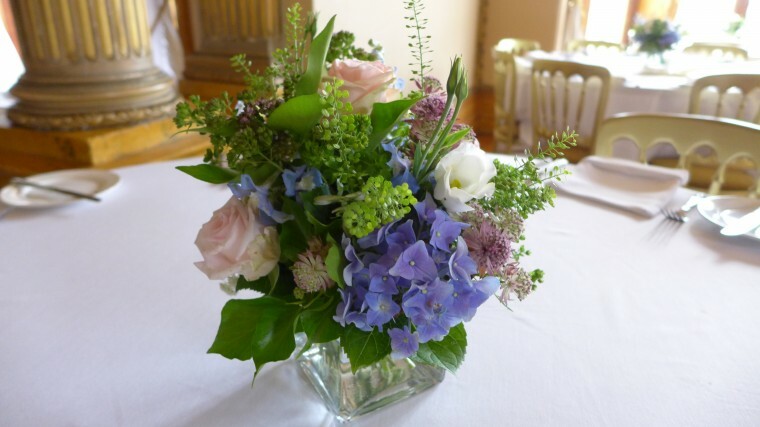 For the reception Laura and Gary chose lovely soft pinks and blues and again to have a country look, as if picked form the garden! So we did posies of summer flowers in glass cubes with hydrangeas, sweet avalanche roses, green bells astrantia and lisianthus. The ballroom at Orchardleigh is beautifully decorated in warm golds and creams, so works perfectly with almost all colour schemes and for this time of year I thought the bride and groom’s choice looked really lovely.